The SA-8 v.3 represents the pinnacle of low distortion, ported box 8 inch subwoofer technology. We built on our experience with the SA-8 series dating back to the original model which launched in 2010 to create something completely unique to the market. Every piece of the SA-8 v.3 has been custom tooled with the utmost performance and lowest distortion in mind. We started with a proprietary FEA optimized motor design engineered just for the SA-8 v.3 which features a large aluminum faraday right for low magnetic and inductive distortion levels. 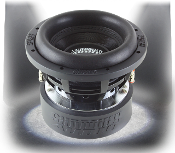 This motor is mated to a custom tooled and patented (US Patent D691595) frame which allows for a larger spider and superior clearances to nearly any other 8" woofer on the market today. The spider itself was custom tooled to achieve a very even compliance curve over its entire range of stroke and also features large tied down “XL” tinsel leads to handle incredible amounts of power and abuse. The SA-8 v.3 features a full 16mm of Klippel verified one-way linear excursion and mechanical capacity in excess of double the linear limits (around 2.5” peak-to-peak) to ensure that mechanical failures are nearly impossible. We also tooled an all new surround for the v.3 update with the same incredibly linear geometry as the Mega-Roll v.2 surrounds found on our larger woofers (X v.2 series and larger). Overall Diameter w/ Gasket= 8 5/8"